The World Club Challenge represents 80 minutes to define a world champion. It is a unique occasion with the best club sides from the two best leagues in the world given the chance for a brutal arm wrestle in front of a full house. 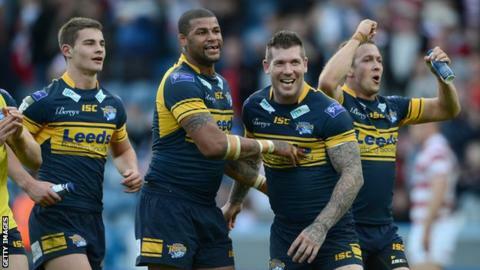 Leeds coach Brian McDermott says the game is as big as a Grand Final, or a Challenge Cup final. "This is something everyone at the club wants to be involved in, and wants to win. It is huge, and the scale of it is not lost on us." Sports fans who don't follow league closely often ask me if the game is a big deal. That is probably because the corresponding fixture, or fixtures, in football are a bit of a waste of time. But this is a big deal. England and Australia love beating each other at any sport for a start. And with the Aussies often holding sway in international rugby league, this match offers a great opportunity to strike a blow on the club scene. Home advantage is often used as an argument against the fixture's claims to be a real world championship decider. Not only is the game being played in England, it is being played in Leeds, and it is being played at the Rhinos' home ground. The intensity of Headingley as opposed to Elland Road previously, did seem to unsettle Manly in their defeat here 12 months ago. This is something of which the Melbourne coach Craig Bellamy is acutely aware. "They are at home and it will be a tough ask for us in front of their home crowd. "I hope our boys can handle playing in front of 20,000 of their own fans and hardly any of ours - they will need to if they are to enjoy the experience." Bellamy leads Melbourne into a World Club Challenge for a third time. All three have been against Leeds, with one win and one defeat for him to date. "We know their calibre, especially their senior players who are wonderful," he says. "We need to make sure we are ready. We need to be at our best to beat Leeds. I'm just worried about us competing. If we perform well we can win." Leeds half-back Danny McGuire tells me last year's World Club win over Manly was the most intense game he has ever played in. McGuire has played against Australia and New Zealand for Great Britain, and in Grand Finals and Challenge Cup finals for his club. Friday will be his 300th Leeds appearance in his testimonial year. A lot of players, no doubt having had it drummed into them by their coaches, insist they keep their focus and feet during huge games like this by treating it as just another game, just another week in training. But McGuire admits that's nonsense. "The week leading up to the game is far more exciting week than a normal week. We have earned this so we deserve to enjoy it and we want people calling us world champions." Can they defend their title? "I think we will do OK," he says with a smile. Leeds' bid for a record fourth world title in a record sixth appearance will be witnessed by some famous faces too. Manchester United striker Wayne Rooney has adopted the Rhinos as his Super League team and has already wished a few of the players well. Actor Matthew Lewis - Neville Longbottom in Harry Potter, will cheer the side on as he does every home game, and the trophy will be presented by local boys and Olympic triathlon heroes Jonny and Ali Brownlee. The Storm want to crash the party and, despite it being their "pre-season", remain confident that Billy Slater and Cooper Cronk can inspire them to do so. Having arrived in West Yorkshire to a blanket of snow the Aussies were reassured by unseasonably bright sunshine in Leeds this week, but my BBC weather colleague Simon King tells me Friday will not be to Melbourne's liking. "Very cold, dry and with a 20% of light snow in the air," was his midweek verdict. He's often wrong of course. The romantic in me would prefer this to be a more "even contest". By that I mean not played in conditions to which the Australians are not accustomed. Not played on their opponents' ground at the other side of the world. And not played during the Super League season but before their NRL year has even started. But I struggle to see what the other options are. Perhaps given the class of the Australian club game, this is the cliched "leveller" that the contest needs unless it is completely revamped and expanded beyond two clubs. For player safety reasons I fully understand it. But the majority of the players I have spoken to tell me they play professional rugby knowing full well what the risks are and that the controversial collision is "fine if done properly". The occasions when that has not been the case and has resulted in injury has now deprived the game of it completely.